Abstract: This article shows the working principle of AC drive (variable frequency drive, or VFD). The performance of AC drive is also described. 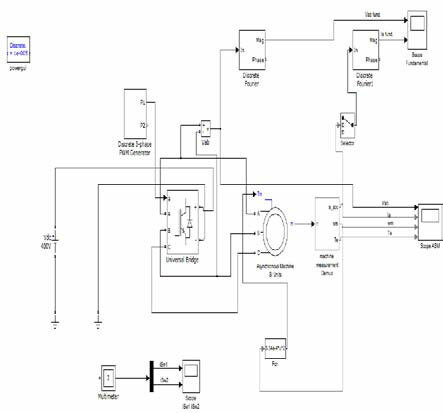 The simulation model is simulated using MATLAB Simulink and their results are also analyzed. The Total Harmonic Distortion (THD) in waveforms is also analyzed. The use of VFD has been increased dramatically in the field of HVAC applications. The common applications of AC drives are in air handler, chiller, pumps and tower fans. A better understanding of ac drive's working principle with leads to improve in application and selection of both equipment and HVAC system. This article is intended to provide a basic understanding of AC drive terms, AC drive operations and Power Factor improvement, Harmonics mitigation by AC drive and a simulation project to show how AC drive is beneficial for energy savings. In addition to this paper will discuss the comparison between VFDs and other technologies with respect to industrial standards. For understanding the basic principles behind AC drive operation requires understanding three basic section of AC drive: the Rectifier unit, DC Bus and the Inverter unit. The supply voltage is firstly pass through a rectifier unit where in gets converted into AC to DC supply, the three phase supply is fed with three phase full wave diode where it gets converts into DC supply. The DC bus comprises with a filter section where the harmonics generated during the AC to DC conversion are filtered out. The last section consists of an inverter section which comprises with six IGBT where the filtered DC supply is being converted to quasi sinusoidal wave of AC supply which is supply to the ac motor connected to it. Frequency = Electrical Frequency of the power supply in Hz. No. of Poles = Number of electrical poles in the motor stator. Thus we can conveniently adjust the speed of an AC motor by changing the frequency applied to the motor. There is also another way to make the ac motor work on different speed by changing the no. of poles, but this change would be a physical change of the motor. As the VFD provides the frequency and voltage of output necessary to change the speed of a motor, this is done through Pulse Width Modulation VFDs. Pulse width modulation (PWM) variable frequency drive produces pulses of varying widths which are combined to build the required waveform. As the frequency can easily variable as compared with the poles of the motor therefore ac drives are frequently used. Where N = number of turns per phase. If the same voltage is applied at the reduced frequency, the magnetic flux would increase and saturate the magnetic core, significantly distorting the motor performance. The magnetic saturation can be avoided by keeping the ϕm constant. Moreover, the ac motor torque is the product of stator flux and rotor current. For maintaining the rated torque at all speeds the constant flux must be maintained at its rated value, which is basically done by keeping the voltage - to - frequency (V/f) ratio constant. That requires the lowering the ac motor voltage in the same proportion as the frequency to avoid magnetic saturation due to high flux or lower than the rated torque due to low flux. As the AC drive provides the frequency and voltage of output necessary to control the speed of an AC motor, this is done through PWM VFDs. PWM drives produce pulses of varying widths which are combined to build the required waveform. A diode bridge is used in some converters to reduce harmonics. PWM drives produce a current waveform that more closely matches a line source, which reduces undesired heating. PWM VFD have almost constant power factor at all speeds which is closely to unity. PWM drives can also operate multiple motors on a single VFD. 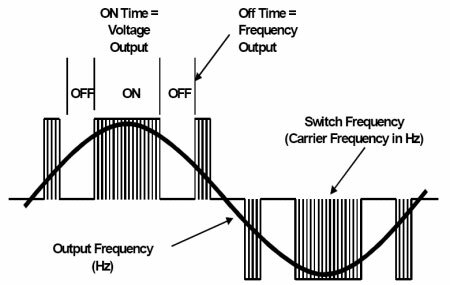 Thus the carrier frequency is derived from the speed of the power device switch remains ON and OFF. It is also called switching frequency. Therefore higher the carrier frequency higher the resolution for PWM contains. The typical carrier frequency ranges from 3KHz to 4 KHz or 3000 to 4000 times per second as compared with older SCR based carrier frequency which ranges from 250 to 500 times per second. Thus it is clear as much as higher the carrier frequency higher will be the resolution of output waveform. It is also noted that the carrier frequency decreases the efficiency of the VFD because it led to increase the heat of the VFD circuit. Large energy savings at lower speed. Increased life of rotating components due to lower operating speed. Reduced noise and vibration level. Reduction of thermal and mechanical stresses. For variable speed control of AC electrical machines several power electronics switches such as IGBTs, MOSFETs and GTO use as forced - commutation method. Earlier techniques such as the DC motor and Thyristor Bridge which are replaced with new techniques such as Voltage Sourced Converters (VSC) are fed by PWM to the asynchronous machine. As the flexibility of speed and torque control with DC machine, the same can be obtained by the combination of PWM technique with modern control technique such as Field Oriented Technique (FOT) or Direct Torque Control (DTC) methods. In this section a simulation of VFD working on an asynchronous machine is been described. The machine library of simulation consists of four most common three phase machine asynchronous machine, permanent magnet synchronous machine, simplified and complete synchronous machine. The following machine can be used either used as generating mode or motoring mode. These machines can be used to simulate electromechanical transient in an electrical network when combined with linear and non linear elements such as transformer line loads, breakers, etc. 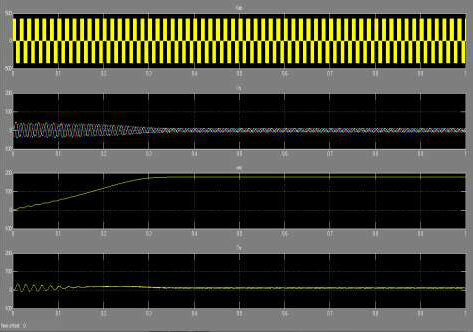 for simulation of VFDs they are combined with power electronics devices. The power electronics library of simulation contains diodes, thyristors, GTO, MOSFET and IGBT. These several blocks interconnected with each other to form Three Phase Bridges. Simulation of 3 HP, 4 pole motor is done with an ac drive using PWM technique. Frequency and amplitude of output voltage is varied by using PWM technique and these controlled voltage and frequency are used to control the ac motor speed. The voltage, current, speed and torque waveform are analyzed. At the time of simulation is running the fundamental component of voltage and current are allowed by two Discrete Fourier Blocks. Thus for observing harmonics component we would require Discrete Fourier Block for each harmonic. This approach is not convenient. For displaying the frequency spectrum of current and voltage waveform we require FFT tool of Powergui. With time variable generated by the scope block, the signals get stored in ASM structure and signals are saved into the ASM structure is sampled at fixed step which satisfy FFT tool requirements. As the Display option is clicked the analyzed signal is displayed. At the bottom window the frequency the frequency spectrum is displayed. As the fundamental complement and the Total Harmonics Distortion (THD) of Vab is displayed in the spectrum window the magnitude of ac drive voltage fundamental is (312V) which compared with the theoretical value (311V for m=0.4). The simulation result is being calculated from a 4 pole ac motor of 3 HP and the Harmonics analysis using FFT tool of simulation of maximum frequency 5000 Hz. It is clear that THD (V) level increases with as the value of fundamental frequency increases from 70Hz and also the fundamental frequency decreases 45 Hz or below. Thus the range of variations of fundamental frequency should be kept in between 70 to 45 Hz. It is also seen that the values of THD (V) in case of 70Hz, 60Hz and 45Hz is quit high as compared to other frequency presents in between them, this is because of presence of ODD Harmonics in these frequencies, as we know that the ODD harmonics is more harmful for the promotion of Distortion in the circuit than the EVEN Harmonics. Since the maximum frequency is set as 5000Hz therefore it can be easily calculated the order of Harmonics. Thus the consumption of electrical energy is depends on the load requirement. However the variation of frequency leads to the harmonics distortion which can be mitigate by several techniques of harmonics mitigation. The variation of THD in between the fundamental frequencies is keep changing therefore there are variation for distortion which leads to the calculation of energy savings is quite possible as well as speed control of the ac motor. Further the introduction of filter techniques can lead to the mitigation of harmonics level in the circuit. Basically the application of Band Pass Active Filter is quite suitable for mitigation of harmonics in this level. It can be introduced as a future research work of this article. Thus from the analysis of table it is clear that the frequency variation leads to the harmonics change in the machine also as the speed decreases the Total Harmonics Distortion in voltage as well as in current increases and THD in voltage is lower than THD in current. It is also to be noted that too much variation in frequency also leads to increase in the THD voltage as well as THD current levels. Thus the VFD can make the ac motor work at variable speed as well as energy savings. For high performance providing by the VFD for maximum process productivity always required a complex engineering consideration. However rapid improvements in AC control technology combined with ready availability of standard fixed frequency of AC motor have increased the number of possible solution. With the process of PWM, the frequency given to the ac motor can be set in order to control the speed of the ac motor. Thus the consumption of electrical energy is depends on the load requirement. However the variation of frequency leads to the harmonics distortion which can be mitigate by several techniques of harmonics mitigation. The elimination techniques of harmonics are basically applied to lowest harmonic because as the filtering is more practical at higher harmonics, the filtering component can be smaller and less expensive. Also application of several multilevel ac drives provides another approach to harmonics cancellation. For the mitigation of harmonics from the circuit of the AC drive application of active filters are required into the circuit such as Band Pass Active Filter. Thus after the study of AC drive working principle, it becomes possible to control the speed of AC motor as well as to conserve the electrical energy, as we know that the energy conservation has become an important subject to all over the world. Increase in efficient energy use, decrease in energy consumption and/or consumption from conventional energy sources is reduced that leads to the conservation of energy.